1. Weather induced power and internet outages, illness and life in general have gotten in the way lately. I've been Horrible with a capital "H" about responding to the comments left on the blog. I apologize profusely. I have read and appreciate them all, I just haven't always been able to respond. I will try to be better about it going forward however. 2. Regarding last week's favorite trees list... 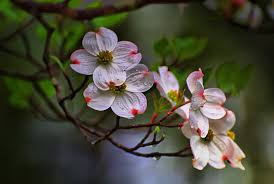 Many of you responded that dogwoods were on your top three list. I love dogwoods too. In fact, they'd probably be my #1 favorite except.... The dogwood is Virginia's State Flower and as a child my parents had me convinced that if I even touched one, I'd go to jail. I remember our neighbors had one in their front yard and it was a thing of beauty! The gorgeous blossoms, the shiny, red berries, the pretty bark and low hung branches just begging to be climbed.... My parents preached that picking the blossoms (or leaves, twigs or berries) was illegal. Harming the tree in anyway, specially the harm that might be caused by climbing it, was illegal. I'm sure my parents instilled that fear of the dogwood just to keep me off the neighbor's property but.... A tiny bit of that fear lives on. 3. The weird, random facts you learn from blogging is amazing. My last post mentioned that my nose was so stopped up, I couldn't smell the Vicks VaporRub. (I'm feeling much better now by the way.) In the process of Googling whether it was Vicks "Vapor Rub" or "VaporRub," I stumbled across an article saying that to quell a nigh time cough, slather Vicks on your feet, put on a pair of socks and go to bed. There's no way smearing Vicks on my feet could have anything to do with helping me not choke to death on gobs of post nasal drip all night long. There was just no way! But what did I have to loose? I tried it. And you know what? I slept like a baby! I went to bed with Vicks smeared feet and a nose still so stopped up that I couldn't smell the Vicks. And I woke up feeling about 1,000% better. Now, I didn't wake up 100% "well" but I could breathe through my nose and as far as I'm aware, I did not wake up coughing and gagging a single time throughout the night. Did smearing Vicks on my feet really do that?? I knew (but never tried it) cayenne pepper in your socks would help with some problems (can't remember right now), but never heard about Vicks. May need to try that some day. Sorry to hear about power outages. Combined with a flu/cold that's a pretty nasty end-of-winter period you're going through. It's been a rough 2 weeks but we'll get through it. I'm also Very happy that we didn't get hit by the Nor'easters that have been blowing up the coast lately. Things could have been much, much worse! During my two month battle with a sinus infection, I learned about the Vick’s on your feet thing too. And then I learnd that I could make my own vapo rub using coconut oil, eucalyptus and peppermint. It is lovely and so good for my dry heels. Hope you are on the mend soon. Thanks, I'm definitely on the mend, and so are my feet. :) The Vicks has worked some serious magic on my yucky winter feet. I hope you are feeling better soon too. I've heard that Vicks thing too. I've never tried it, but I'm guessing the vapor still gets up around your nose and the petrolatum probably softens your feet too. Bonus! The Vicks has been amazing! Not only has it helped me breathe, but my yucky, calloused, winter feet are suddenly summer flip-flop ready. My Mom used Vicks liberally on me when I was young, but never on my feet. I have no doubt that it would help though. I used to get horrendous ear aches, and Mom heated a saucer in the oven, wrapped it in a towel so I could place it on my ears. It was divine and so helpful. Vicks was a childhood staple for me as well, but never on my feet. I always used a hot water bottle for my ear aches. My husband's family's solution was to blow cigarette smoke into the bad ear. Sounds horrible to me but my husband swears it helped. Too blocked up to smell Vicks!? That's quite something! I'm making a note of the Vicks on your feet trick for coughs. It's good to hear are you are feeling better now though. Thanks! Try the Vicks - it really does work! I hope that you feel better soon, Vicks reminds me of my gram and mom. Next time I have a bad cold, I'm going to try Vicks on my feet. Why not?